Many of the Pokemon sprites have been killed to death. Steelix's mouth looks like a chessboard, Hitmontop looks like a rag doll with its floppy limbs, and they've made a version of Porygon that looks like it's had its head squashed by a compactor. They've saved a few sprites that had been ruined in Platinum, though. I like Charizard, Moltres, Granbull and Scizor. And they've rescued Ninetales, who looked stupid in Platinum with all those tails curled while standing up. In my opinion, the overall quality of the artwork has gone down a little bit. I'm a perfectionist for little details like the shape of the face and body proportions, which have been compromised in too many cases. Porygon's supposed to be a robot-like Pokemon. what else do you expect? Actually, I said robot-like not Robot Pokémon. Meaning it looks like a robot but it is not a robot. oops. sorry bout that manaphy. I like Sabrina's a lot, and Jasmine too. I don't really like how misty looks in this one. I also really hope there aren't too many firebreathers, he looks awful. Sabrina's my hands-down favorite, but the Rocket Executives look pretty BA as well. And who doesn't love someone that wields a remote controlled robot Pikachu? And I daresay the Pokemon ones are better than they've been in a long time. is all like "oh dear, you're attractive"
Wow I hate Onix now. I dislike Lyra's desing. Pigtails and that ugly hat. ewww. She also wears these ridiculous suspender like things. and very high socks. Ethan isn't all that bad. he's anorexic now, isn't he? looks like he's saying "Follow that bird!!!" anyone else agree with these ideas?? EDIT: Sorry, I didn't realize this topic had already been created. I think the sprites for both look pretty good. Am I the only 1 to notice that if u stare at vulpix long enough,it looks like its angry, which is it just me or do a lot of pokemon look angry in the HGSS games? Also in Crystal they put in a girl for the 1st time in the games, so y in the new games did they take Marina(thats what they called her in the pokemon chronicles thing) out? I mean, Lyra's pretty cool,but I liked marina. (probably because she was in blue...) She kinda reminded me of my character,Crystal(my avatar pic). Well, at least they changed the guy's name to ethan. I don't think jimmy(pokemon chronicles again) was a very good name. As far as the games are concerned, Marina is known as Kris. And I DON'T UNDERSTAND why they redesigned and renamed her!!! The reason I say those girls are the same but different now is because of the flippy pigtails. They should have just kept the same one from Crystal, I agree whole-heartedly. More on-topic, just so my post isn't completely irrelevant, is one of my favorites to have following me. Not sure why, she just is. What they did to Sarbrina and Karen is atrocious. 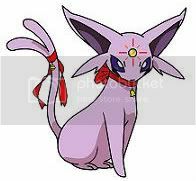 Not to mention mewtwo and suicune look like they are anorexic.